From the June 2016 Desktop News | Dr. Ellen Griffith Spears, an associate professor in New College and the Department of American Studies, is the 2016 winner of the Buford Peace Award. Tony D. Walker, a UA School of Social Work alumnus, established the award in 2002 to honor Lahoma Adams Buford, and each year it is given to a faculty member who has been highly involved in mediating human disputes, helping overcome prejudice, promoting justice, and establishing peace. Spears’ research is broadly interdisciplinary, combining environmental and civil rights history with studies of science, technology, and public health. 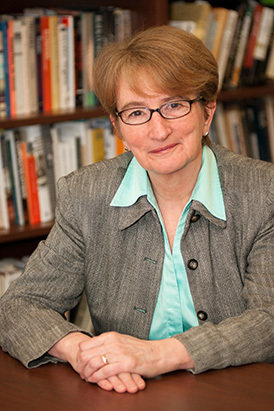 Spears has spoken on the social costs of pollution around the United States and internationally and has authored numerous essays. Her book, Baptized in PCBs: Race, Pollution, and Justice in an All-American Town, published in 2014 by the University of North Carolina Press, explores key questions faced by communities that seek to address systemic class and race inequalities and to tackle toxic pollution. The book received the 2015 Francis B. Simkins Prize from the Southern Historical Association, the 2014 Arthur J. Viseltear Award for Outstanding Contribution to the History of Public Health from the Medical Care Section of the American Public Health Association, and the 2015 Reed Environmental Writing Award from the Southern Environmental Law Center.